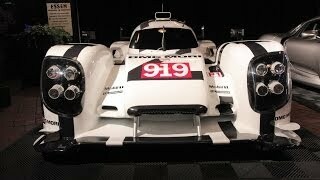 Along with the 2014 Porsche 911 RSR, Porsche introduced the 2014 Porsche 919 Hybrid at the 2014 Geneva Motor Show. Porsche mentions that the 919 Hybrid is our fastest mobile research laboratory and the most complex race car that Porsche has ever built! The exceptional efficiency of the Porsche 919 Hybrid is the result of a carefully balanced overall concept. The sum of all of its individual components forms an effective unit: from the combustion engine to the energy recovery systems, chassis and running gear, aerodynamics and driver ergonomics. The combustion engine is a compact V four-cylinder petrol engine that also serves as a load-bearing member in the chassis. It is a frontrunner of the future-oriented downsizing philosophy features two litres of engine displacement, direct fuel injection and mono-turbocharging, the engine that turns at speeds up to 9000 rpm. The compact engine outputs around 500 hp. 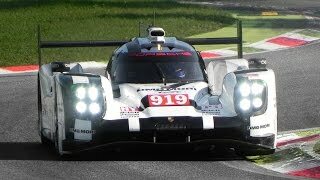 Romain Dumas (France), Neel Jani (Switzerland) and Marc Lieb (Germany) will share driving duties in the Porsche 919 Hybrid with starting number 14. Car number 20 will be driven by Timo Bernhard (Germany), Brendon Hartley (New Zealand) and Mark Webber (Australia).